We offer natural, healthy foods that won’t put a dent in your wallet. We do this out of our love for our dear, sweet, Casey, as well as your beloved 4-legged furry kids. 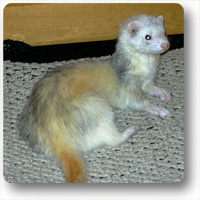 Casey was the first ferret we adopted from the local shelter. He was a beautiful, noble silver with soulful eyes that seemed to permeate every aspect of your being. He chose us that day – clinging to us, and giving us kisses. We couldn’t leave without him. 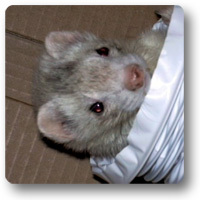 After a few weeks, it became obvious that Casey was suffering from insulinoma, a disease which unfortunately is common in ferrets. He was put on a regimen of prednisone, and we were instructed to feed a high protein and high fat diet, with very little carbohydrates and absolutely no sugar. He was finicky though, wanting to only eat the mediocre kibble he was raised on. However, if we moistened high-protein, high-fat kibble into a gruel-like texture, he would eat that. Sometimes we would add a little chicken baby food to the gruel, or a little of the duck soup mix found on pet store shelves. This was as far as we got with Casey as well as his brother and sister. We’d try to feed them pieces of meat or eggs, but they would sniff and walk away. 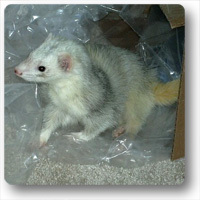 When we helped Casey cross the rainbow bridge in February 2008, our passion to feed our other ferrets more natural foods was renewed. We did our research, chose a brand, and started supplementing their already high-quality kibble with a natural meal once or twice a day. They ate it up! (pun intended) Within a few weeks the change was noticeable: soft fur, healthier teeth and gums, more energy, bright eyes, and just plain happier. Wanting to add variety to their natural meals, we continued our research into other brands of commercial raw diets. What you find in Casey’s Hidden Pantry are some of the foods we currently feed our posse. We hope you decide to enrich the lives of your pets by giving these foods a try. Casey’s Hidden Pantry advocates slow changes when introducing new foods. Many pets are accustomed to sterile, heat treated kibbles and won’t recognize the raw food as edible. By doing the change gradually, not only are you minimizing any mental stress on both you and your pet, but you are minimizing digestive track stress as well. Start by adding putting some of the old food into a storage container. Add a little of the new food to it - just a few pieces will be fine. Now the new food will take on the aroma of the food your pet is accustomed to. The amount of old food will also "hide" the new food, and more than likely your pet will eat the new food without knowing! Gradually increase the percentage of new food included with the old food. Eventually your pet will eat the new food by itself. You can also try the soup method. Mix about 75% kibble and 25% new food in a bowl. Add water and let soak overnight. The next day, add a little warm water and stir until the soup is smooth. Put some of the soup onto the paw or nose of your finicky pet. Your pet will instinctively try to lick it off, and in the process taste the new food. Gradually decrease the amount of kibble in the soup.